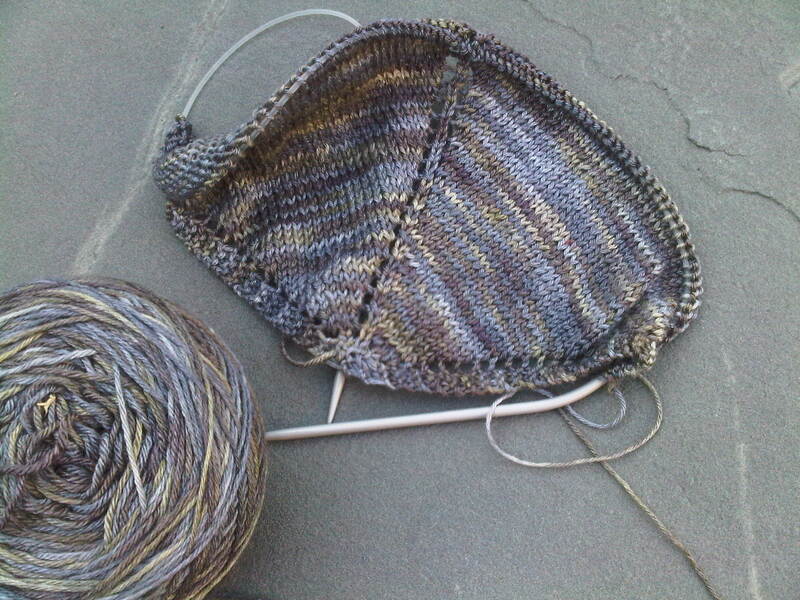 In pursuit of a wrap to wear for our son’s wedding in late August, I’m knitting the Holden Shawlette by Mindy Wilkes. It’s a free pattern download on Ravelry. 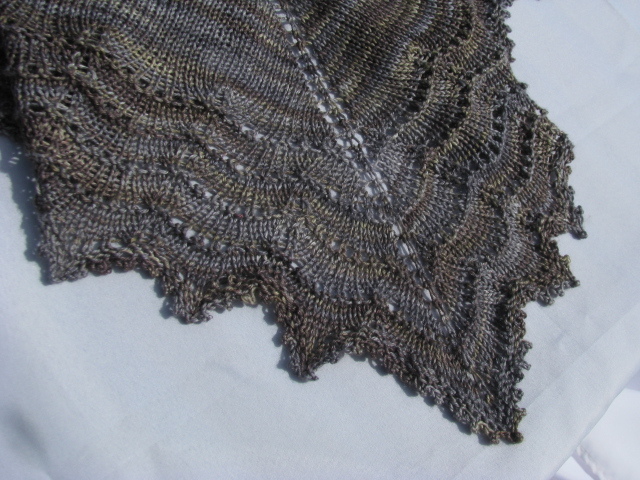 I wanted a lace shawl pattern that was an easy project, as I am pushed for time as usual. But I also needed it to be fairly dressy. 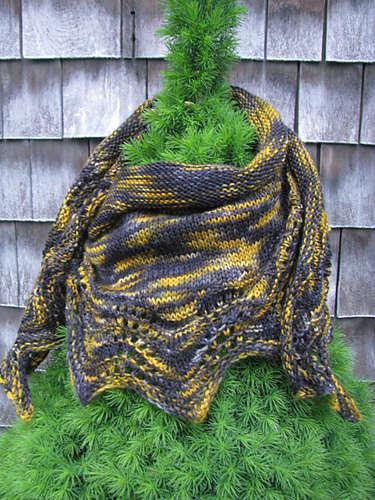 There are two free shawl patterns, using only one skein of sock yarn, in this posting, one that begins at the bottom and the lace one that is cast on from the center neck. Both are easy shawl patterns for beginner first time shawl knitting…great accessories to wear as shawlettes, cowls, or a triangle scarf. You’ll find even more free shawl patterns and Princess Kate’s shawl at knitnscribble.com, link below. The Holden Shawlette, cast on from the center neck, has several inches of stockinette stitch in the beginning rows divided by yarn overs on the edge and in the center. The pattern is so easy to remember, you don’t need markers, as your knitting does the marking for you. I don’t enjoy using markers anyway, but sometimes you just have to. This photo is a little lop-sided, because the circular needle’s gone all wonky, should have run it under hot water to straighten it out before I started casting on. Then the pattern changes to the lace pattern. This one is Mindy’s. 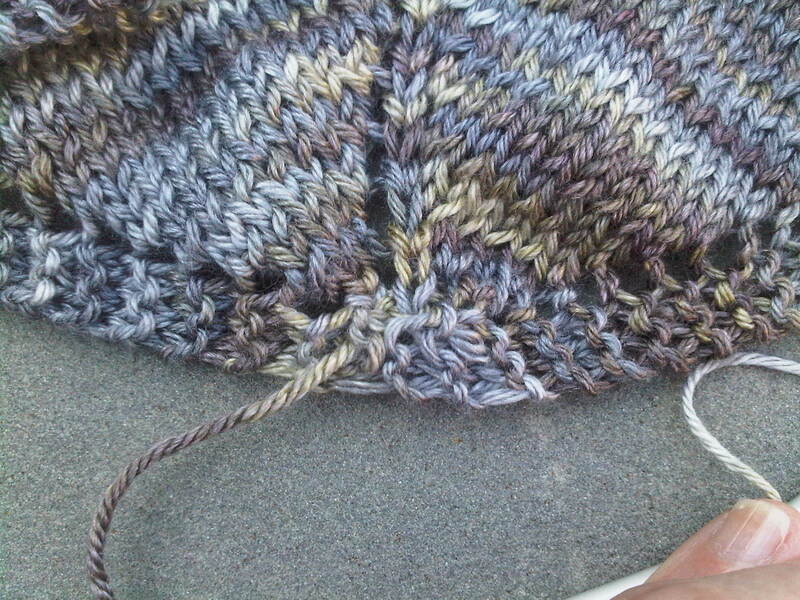 She used one skein of Malabrigo sock yarn, a lovely yarn, hand-dyed with tonal color qualities. I’m using another Merino wool and silk hand-dyed sock yarn. I’m a little disappointed in the color, as it was called ‘silver’, but it’s actually the color of ‘squirrel’. Lesson learned here is to go to your loyal yarn shop if you are wanting a special colorway of yarn, so you can see it up close and personal. May or may not use this shawl for the wedding, jury is still out. It’s a lovely yarn, no doubt, just not the colorway I wanted for this project. 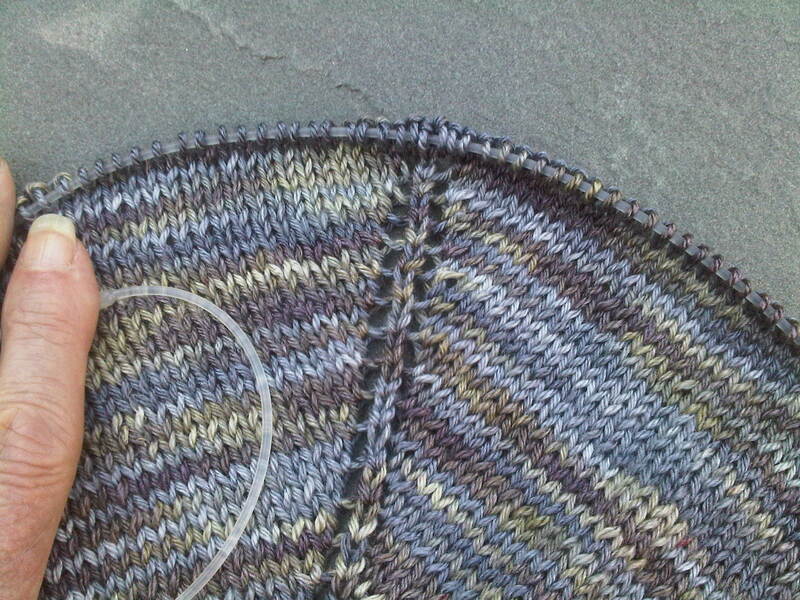 You begin by casting on 3 stitches, using a long-tail method, with a US 6 (4.25mm) needle at the top center of the back, then picking up three stitches on the bumps of those and then three more, sounds confusing, but it isn’t really. The number of stitches are then gradually increased to equal 193 via yarn overs, 4 on every right side row, two yarn overs in the center, and one on each side. 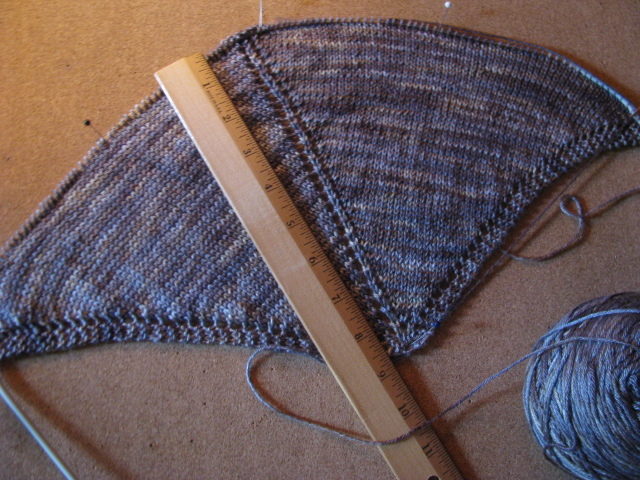 It’s actually much easier than casting on and counting 270 or so stitches as for the Abyssal shawl, which I have made several times in an Old Shale pattern, also mistakenly called ‘feather and fan’. The Abyssal is a fun free shawl pattern to knit, available written in French or English, too, but it begins from the bottom up and requires the tedious counting to start. The pattern is also a free download on Ravelry. Here’s one I made for a birthday present for one of our daughters. Just like the Holden Shawlette, Abyssal can be worn as a shawl or a scarf, very versatile accessory. In any case, the Holden Shawl continues every evening, and I will shortly have reached the lace portion of the pattern. The depth from the center down is about 9 inches now. The finished width will be approximately 55 in by 25.5 inches long from the center down, depending on how it is blocked. Wish me luck! (to be continued…) For even more free patterns, even Princess Kate’s shawl pattern, her famous shopping ruffle shawl, visit knitnscribble.com, where you can enter any keyword to search for free knitting and crochet patterns. Language translation available as well on knitnscribble.com. Yes, diva, I’m hoping squirrel is more becoming as a shawl than the constant pests at my bird feeder…thanks for reading.